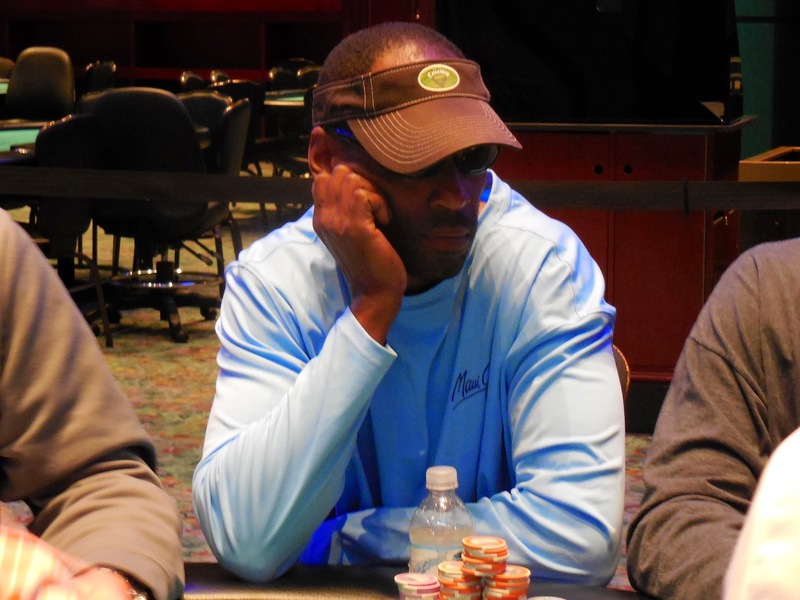 Taylor Black opened from early position and action folded around to Clifford Jones in the big blind. He moved all in, and Taylor snap called. Clifford had run his [4s][4h] into Taylor's [Qh][Qd], and he'd need to catch a four to survive. The board ran out [8s][5s][Ac][Ah][7c], and Clifford will exit this tournament in 7th place, good for $4,006. Taylor Black opened from middle position before Joshua Evans moved all in from the small blind. Taylor thought about it for a bit before he elected to call, taking his [Qh][Jc] up against Joshua's [Ac][Kh]. The [9h][Qd][9c] flop put Taylor in front, but the [Tc] turn opened up four more outs for Joshua. 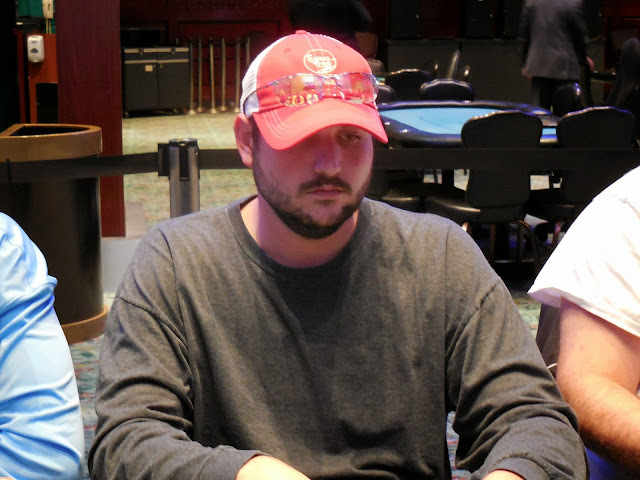 The [9d] river gave Taylor the winning full house, and Joshua will exit this tournament in 8th place, good for $3,133. Michael Bratovich was all in preflop holding [Kh][Qd] and had run into Joshua Silva's [Qh][Qc]. The [6h][3c][3h][2d][Ah] board failed to produce a needed king, and Michael will be eliminated in 9th place. He will earn $2,503 for his efforts. Shahrokh Reza was all in holding [Kd][Td] and was flipping with Chad Brown's [4s][4d]. The [6c][5d][Kh] flop hit Shahrokh, and he would get a double up if he could avoid one of the two remaining fours. The [3c] gave Chad a straight draw, and the [7d] river completed that straight, eliminating Shahrokh in 10th place. He will earn $2,027 for his efforts. As Level 14 concludes, Event #3 $1,125 NLH is down to the final 19 players. The top 12 players will get paid, so there's still a bit of play left until the bubble burst. Two players seated on an outer table had big stacks, and they went to war in a hand that would decide the tournament chip leader. 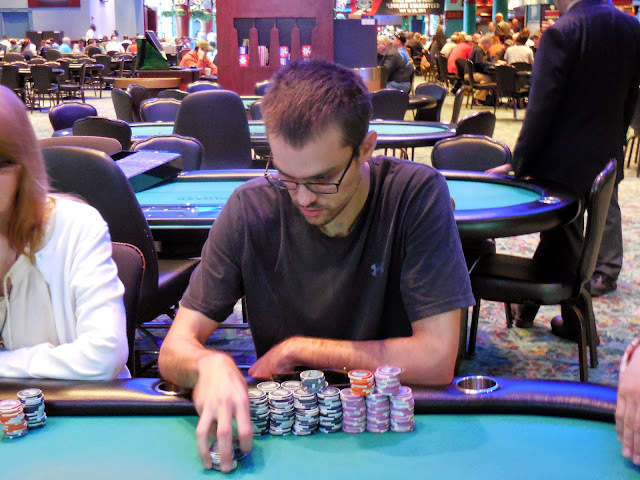 By the end of the hand, Taylor Black emerged with 127,000 chips to lead the event. Taylor is in the hunt for a National Championship seat after 7 World Series of Poker Circuit cashes this season, including 3 final tables. 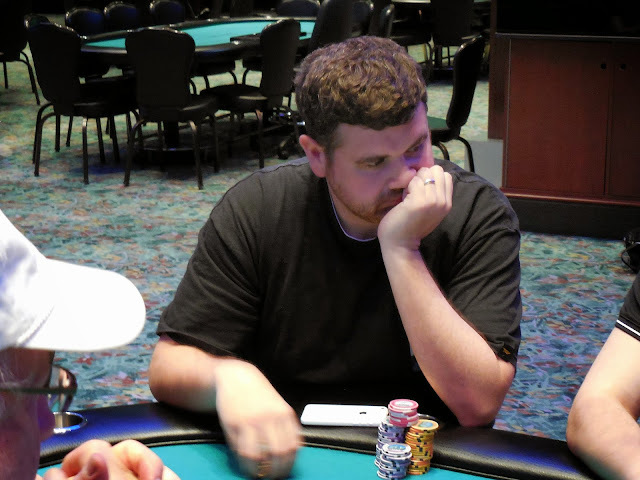 Chris Tryba is still in with 78,000, good for a slightly above average stack. 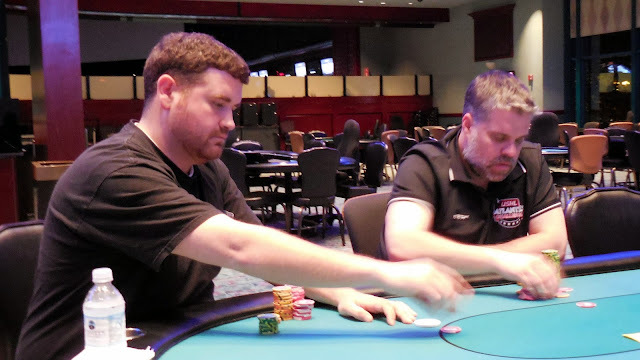 James Campbell sits on 40,000 chips while Tim West is grinding a short stack of 27,000. Blinds are now 1,200/2,400 with a 400 ante. There will be a break after this level. 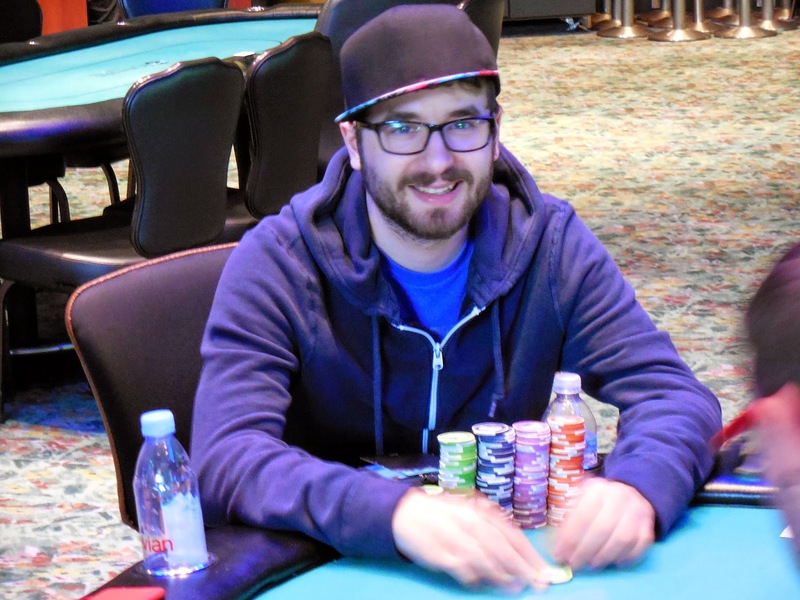 It looks as if Mark Dube is playing his first World Series of Poker Circuit event for this series, and things are going well for him. He is leading the field with about 68,000 in chips. Mark got 2nd place for $105,103 in the last WSOP-C Main Event at Foxwoods, losing to Allen Kessler. 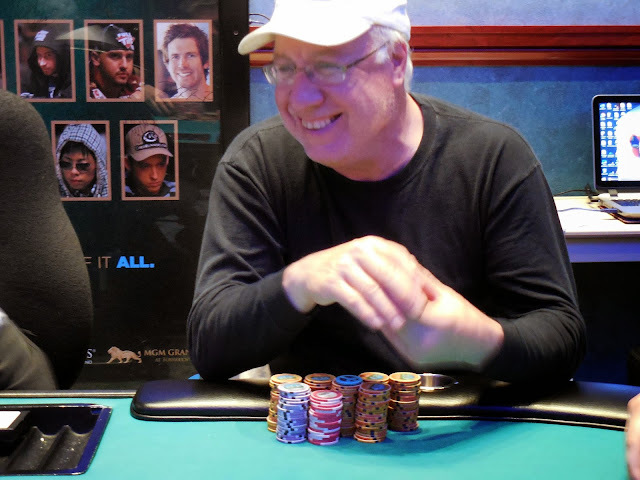 Mark also has 3 other Circuit final tables, but is still chasing that elusive WSOP-C ring. We found Chris Tryba all in on the turn with top pair and a straight draw, but he was behind his opponent's top pair with better kicker. But Chris hit his kicker on the river to double up and survive. Chris busted out of Event #4 $365 Omaha/8 earlier today, so hopefully his back luck in that event will turn into good luck in this event. Chris already holds a WSOP-C ring as well as a WSOP bracelet, so perhaps he will add to that collection in this event. 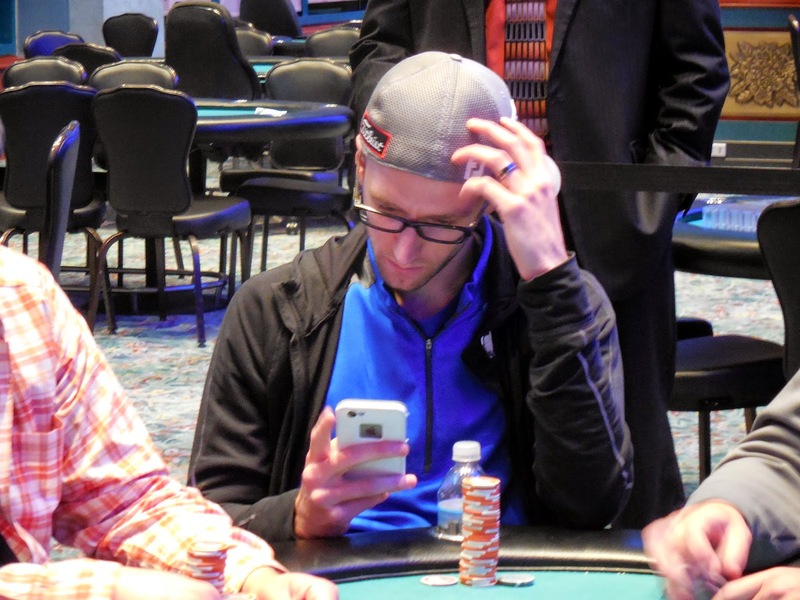 Other players still alive in this event are Andrew Badecker, James Campbell, Tom Dobrilovic, Tarun G., Je Wook Oh, Andy Spears, and Tim West. 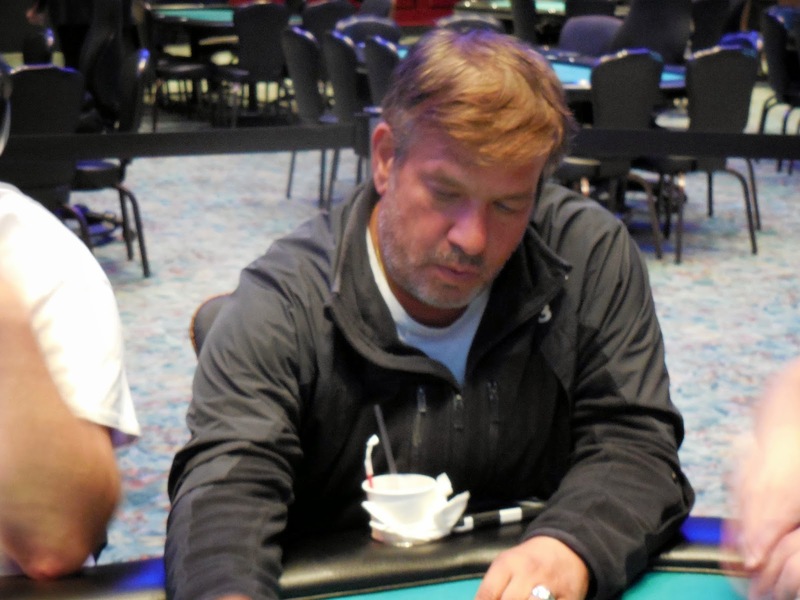 We noticed a few recognizable players in Event #4 $365 Omaha/8 as well. Bobby "The Bus" Ferdinand and Roland Israelashvili are both doing well in this event so far. The field is currently playing 75/150 blinds and 150/300 limits. Levels 1-2 will be 60 minutes, 3-16 will be 30 minutes, & 17-19 will be 40 minutes. Hassan Babajane was all in preflop holding [Ac][Qh] and flipping against Mike O'Connell's [5d][5c]. The [9c][5h][6c] made Mike a huge favorite, but Hassan could backdoor a flush. Hassan was looking for a club to hit the turn to give him some hope, but instead the [5s] fell on the turn to give Mike unbeatable quads. The meaningless [3s] river meant Hassan would have to settle for $6,454 for 2nd place. 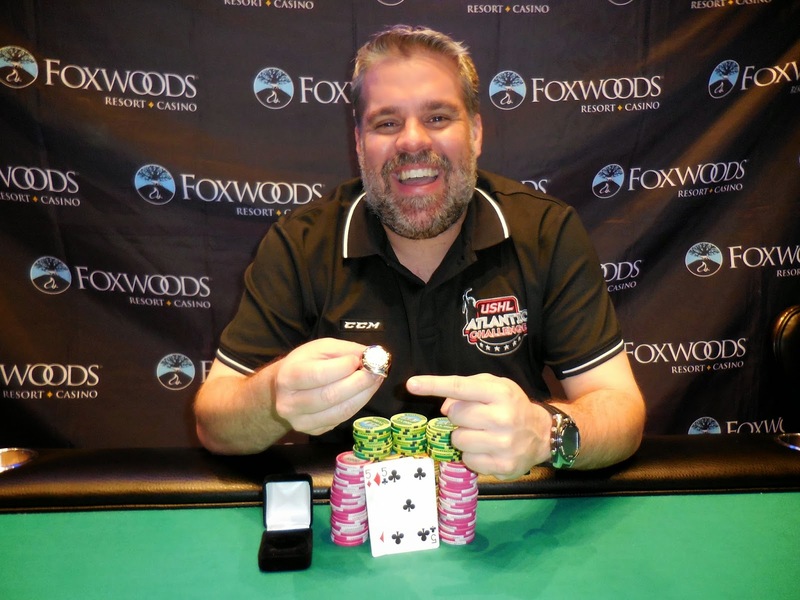 Mike will take home $10,441 for his first place finish, along with the World Series of Poker Circuit ring. All smiles for his winner picture, Mike said he didn't care about the money, he only cared about winning the tournament. Congratulations, Mike! Event #2 $365 NLH is now heads up. Mike O'Connell, shown above on the right, has the chip lead with 800,000. Hassan Barbajane has 400,000. Play will continue for one more level before the day concludes, though there is talk the two may continue until they finish. Bart Fooden lost most of his chips when he ran his pocket tens into Hassan Barbajane's pocket jacks. The last of his chips went in on a [Ac][7c][9d] flop. Bart had bottom pair with his [Qc][7d] but his opponent held [Ts][9h]. The [Kh] turn and [6c] river could not save Bart's tournament, and he will exit this tournament in 3rd place, good for $4,657.